This year I'm once again taking part in a wonderful series called 31 Days of ABCs. Each day throughout October a different blogger shares a project or activity related to a letter of the alphabet. 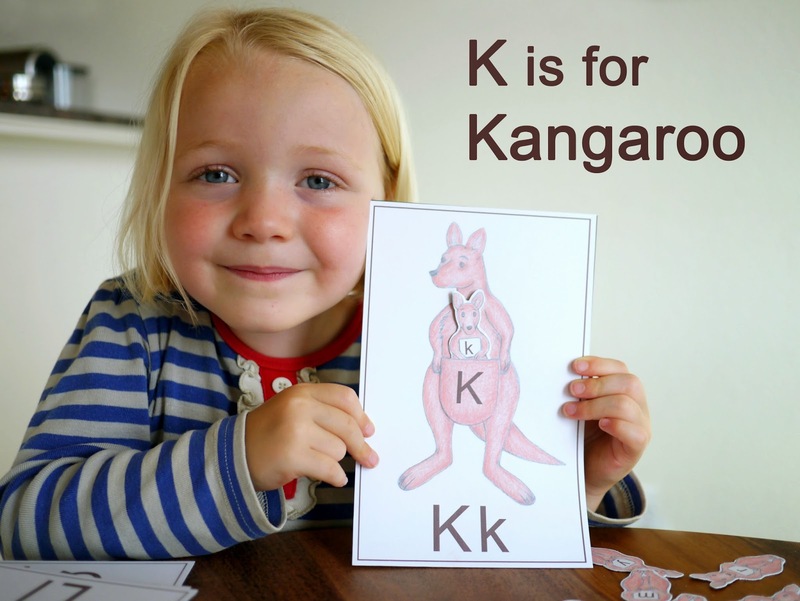 Today it's my turn to share and we're up to the letter K. K for koala, king, kite, key and kangaroo. I'm so excited to share this activity with you. Lola has been learning to recognize and write her letters (both at home and preschool) and one thing that I've noticed is that she gets a little stuck when it comes to matching upper case and lower case letters. Some letters are easy and don't change much between the cases while others look completely different and catch Lola (and many other young children) out. Upper case letters are generally pretty easy, but some of those lower case letters can be a little tricky. Especially when they don't look anything like their big counterpart. I'm looking at you g, r and d! I decided to make Lola a fun card game to help her match up her upper and lower case letters. This is where the kangaroo comes in. I made up cards featuring a mother kangaroo with an upper case letter marked on her pouch. I then made joeys holding a card with the corresponding lower case letter. The pouches on the mother kangaroo are a little pocket that the joey fits into. I printed the upper case and lower case letters on each card to help Lola match up the corresponding joey. After hours of cutting and gluing, the card game was ready for Lola to play with. I'm not going to lie; cutting out all of those joeys wasn't easy work. My hands are still sore! But it was worth it as Lola loves her new card game and has been playing it several times a day. To play, Lola starts with a stack of kangaroo cards in alphabetical order. I mix up the little joeys and spread them out on the table making sure they're all face up. Lola then sets about finding the joeys to match the kangaroos. Lola is pretty proud of herself when she matches up the letters correctly. Sometimes the matching letter takes a little while to find. And sometimes a similar looking letter proves to be a little confusing. Oops! Using the letters at the bottom of the card helps Lola to make sure that she has matched them up correctly before putting the joey in the pouch. Playing this game also helps Lola with her letter recognition in general. She's usually pretty good with her letters but sometimes gets a little stuck. Playing with the cards in alphabetical order helps her out when she can't remember the name of a letter. She just sings her alphabet song and stops once she has gone through all of the letters that she has already matched up. Laying the cards out in front in alphabetical order once they'be been matched up helps too. Lola loves her new kangaroo card game so much that once she has matched them all up she pulls the joeys out of the pouches and starts all over again. I'm really happy with how the kangaroo card game turned out. I haven't drawn anything in such a long time and feel like I haven't had a chance to be creative in ages so it was fun to get back to it. It's so satisfying to complete something that your kids love to play with. 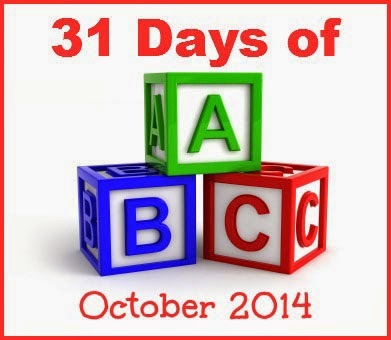 Big thanks to Leanna of All Done Monkey for organizing 31 Days of ABCs again. Make sure you check out the other posts in the series. You can find them all here. You can also find all the featured posts plus more ABC related ideas on the 31 Days of ABCs Pinterest board. What a fun game! Great for fine motor skills, too. I am sure my kids would love this - adorable!